RacingBrake Discs - How are the discs made? So why do I need Carbon Ceramic Brakes? 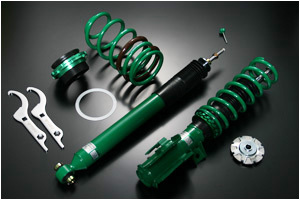 The Street Advance damper is the evolution of TEIN's popular Super Street coilover kit. Developed to provide a sporty ride feeling and aggressive stance, along with wide-range damping force adjustment using their new Advance Needle technology, giving the driver a much more noticeable feel in damping force change. The shortened shell case design provides optimum damper stroke at lower than standard vehicle ride height. Vehicle ride height is adjustable via the ZT coated threaded sleeve. Updated internal components and external coatings increase durability and product life. Street Advance dampers are great for daily driving and spirited driving for all types of drivers. Powder coated damper body Non-welded ZT coated Adjustment Tube Full-Length Dust Boots 1-piece Aluminum Spring Seat with Delrin Thrust Washer. The owner of RBE, Clive Haynsford, has a long career in motor engineering and motor racing that started by embarking on an apprenticeship initially with Mazda in 1973, all of which now helps give Racing Beat Europe customers the correct advise for their vehicles. ShyAuto provides parts for any other make of car but Clive's own passion is Mazda's remarkable rotaries, in particular,the RX7, and now ownership of his Classic RX-4 and racing his 400BHP RX-8.